Dave Simpson led twelve cyclists from Eastern Park to Basil’s Farm via Drysdale and Swan Bay Road. Basil’s Farm, was once a hobby farm owned by Basil Halsall, a cyclist who won the Sun Tour in 1952. The farm today is an organic masterpiece, with cafe and huge outdoor seating area overlooking Swan Bay. Most of the food served is either from the farm, or local area. After a long stop for refreshments (due to Sunday business – a large number of brunch customers eating for the whole week if appeared), and with well-caffeinated legs to bolster the return, the group set off to complete the circuit via Bellarine Highway, with a split organised to allow faster riders to go ahead. The riders today were (from L to R in the photo below): John M, Chris Hu, Helen, Rolf, Doug, Peter J, Peter O’B, Dave, Dirk, Barbara and John H. John C joined a few km into the ride. 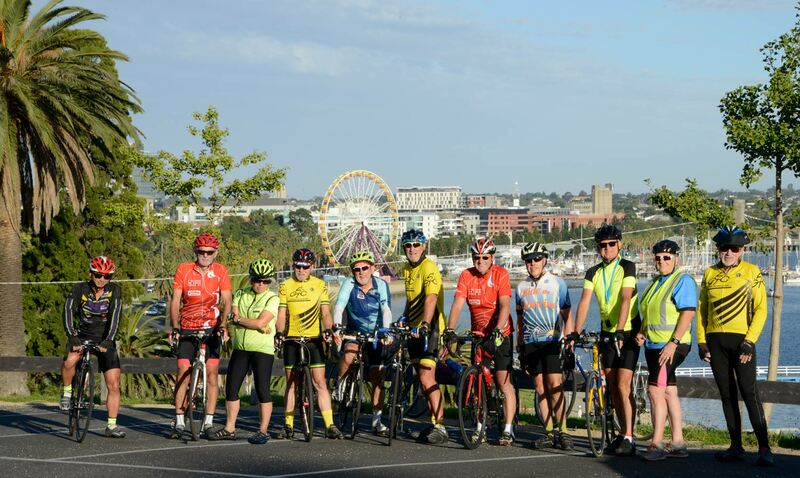 Thanks to Dave, ride leader, and John Hagan for the photos and map. This entry was posted in Joint rides with GTC, Ride reports, Uncategorized and tagged Basils Farm by hlyth2013. Bookmark the permalink.